Wow, that title is quite a mouth-full! I think you’ll agree, the quilt looks great! I added a narrow black & white striped border around the outer edges of the triangles to create a visual separation between the pieced hexagons and the lovely water-color printed & embroidered background fabric. Yahoo! 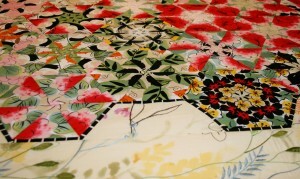 My quilt is now underway! After laying out all the pieces, moving the hexagons around until the colors blended and flowed from one area to another. Here is a preview photo of my design, with the first row (on the left) sewn together. You can see the design shrinks quite a bit once the seams are sewn together! 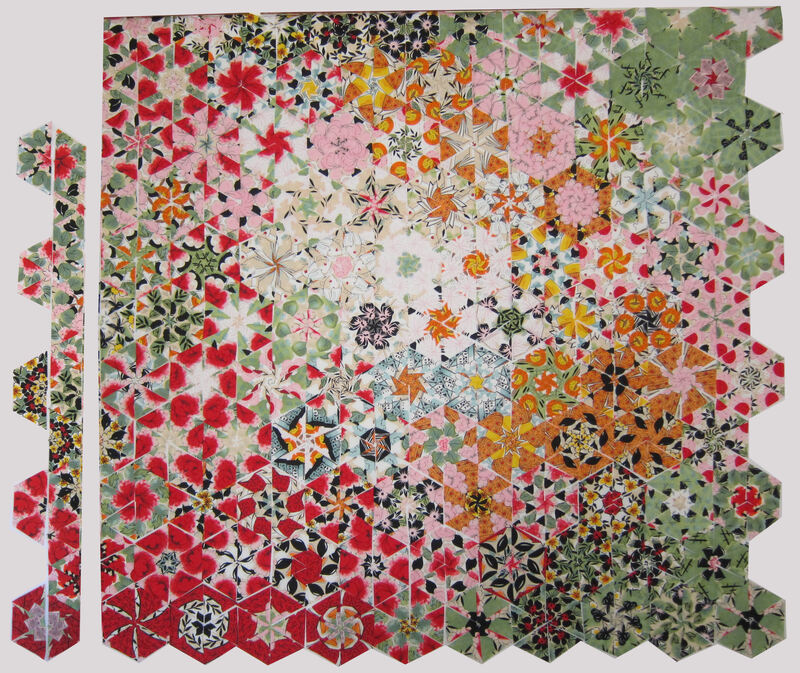 When sewing the rows together, I use a slick trick that I developed when sewing a previous quilt−my Indian Summer Thousand Pyramids quilt. 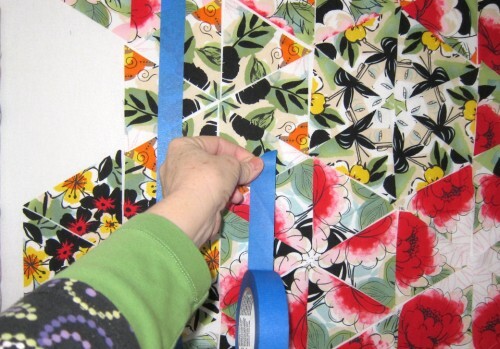 Using an ordinary 1″ wide roll of painter’s tape, begin applying tape at one end of a long row of loose pieces. Press firmly as you apply the tape, securing all the loose pieces to the single piece of tape. 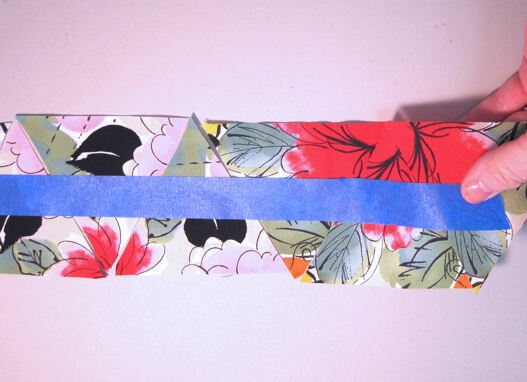 Gently lift the tape & pieces, carrying them to your sewing table. 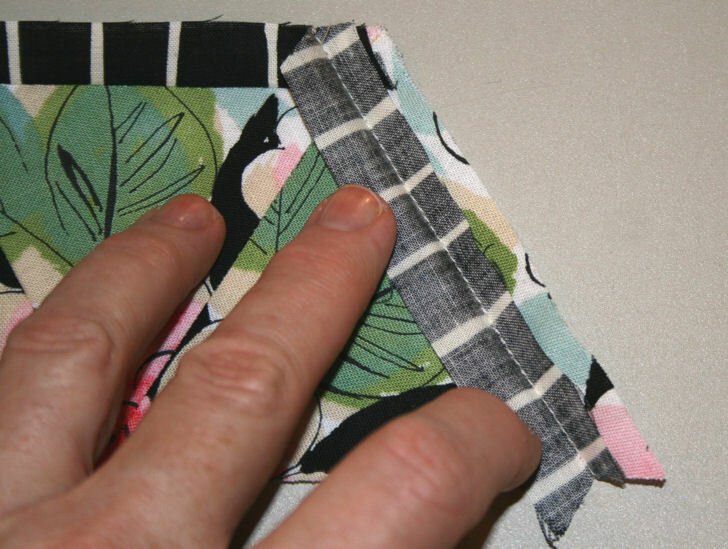 Begin sewing ANY project by establishing an accurate seam allowance. When you resume sewing, double-check your seam allowance to verify you always sew with the same seam. 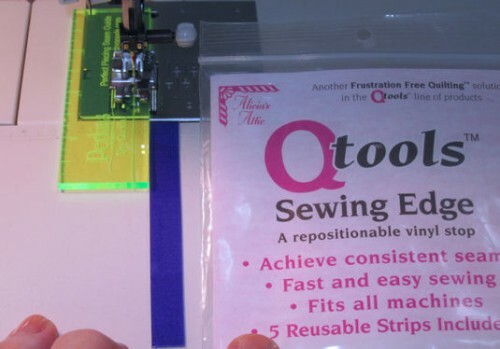 This one step will insure every project you sew will fit together much more accurately. I use one of two seam allowance tools, pictured below. 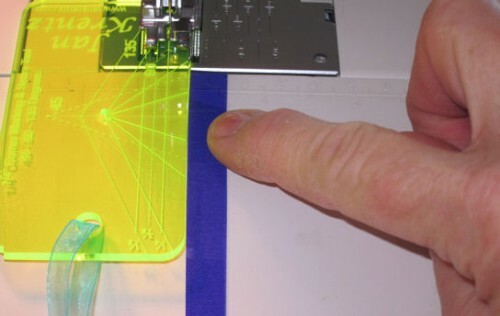 Lower the needle into the scant 1/4″ hole BY HAND. Lower the presser foot. Apply a raised guide such as stacked painter’s tape, or Q Tools vinyl tape to the right edge of the tool. or use the Jan Krentz Corner Marking tool (designed for seam accuracy and marking tips and edges of diamonds for 8-pointed stars). 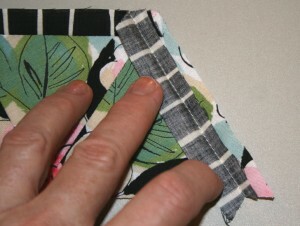 NEXT blog entry >>>> PIECING TECHNIQUE! When creating One Block Wonder or Stack n’ Whack designs, there are clever methods to preview your fabric motifs and see multiple repeats. 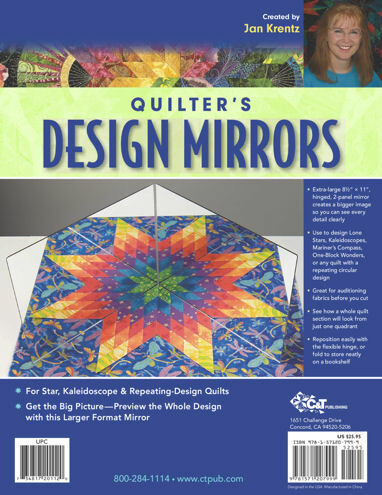 I frequently use a set of hinged Quilter’s Design Mirrors when designing with multiple cuts and repeats for projects such as Lone Stars, Quick Stars, Kaleidoscopes, Mariner’s Compass, hexagonal designs, etc. 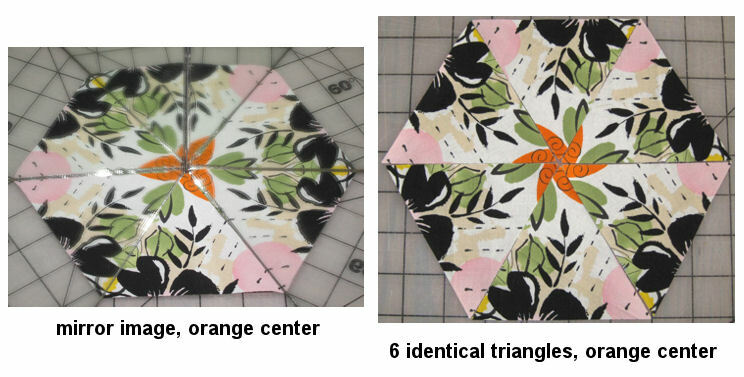 A quick method to determine whether a fabric will be suitable for your “fussy cut” technique is to lay the template shape (in this case, a 60-degree triangle−sold in several sizes) on the printed fabric, and position the mirrors at one tip of the triangle. A repeated hexagon is magically created! The reflected image is not exactly the way it will appear when physically cut, but does give you a good idea whether you’ll like the visual effect of that particular fabric before cutting. 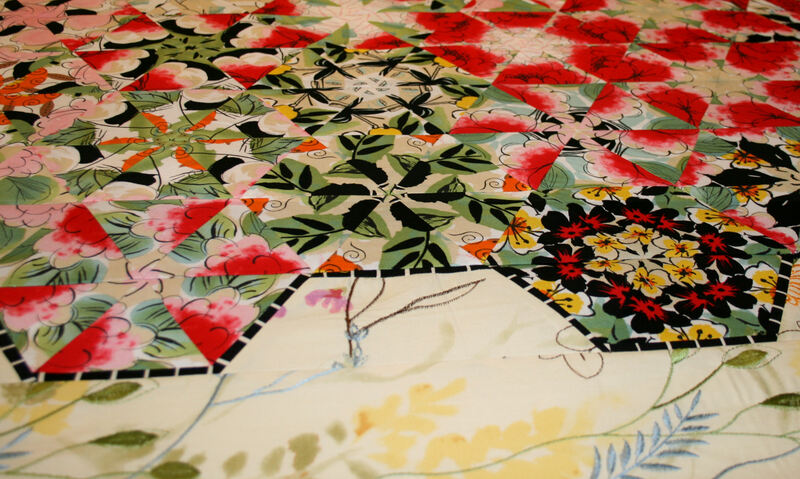 An unsuitable print won’t be exciting−save that fabric for another project. Here are some examples of the same 60-degree triangles−on the left, the mirror image and on the right, six identical cuts from the same image (also known as “fussy-cut”). Both versions are enticing! 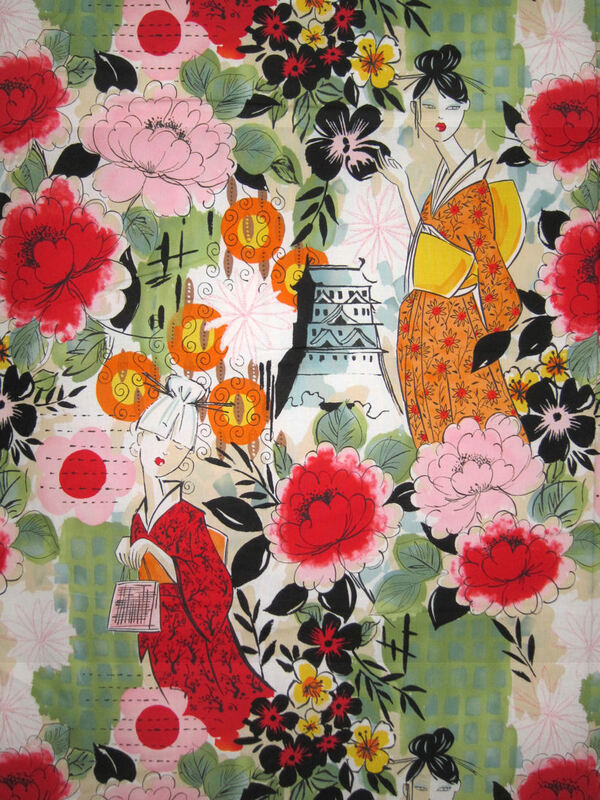 However, if your printed yardage doesn’t have mirror-image motifs, you will not be able to create the images on the left. The combinations below are the same triangles; each combination is rotated to view a different tip in the design center. 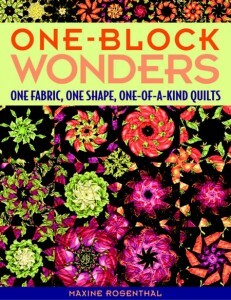 I am inspired to make a new quilt—based upon the designs seen in the book One Block Wonders by Maxine Rosenthal. 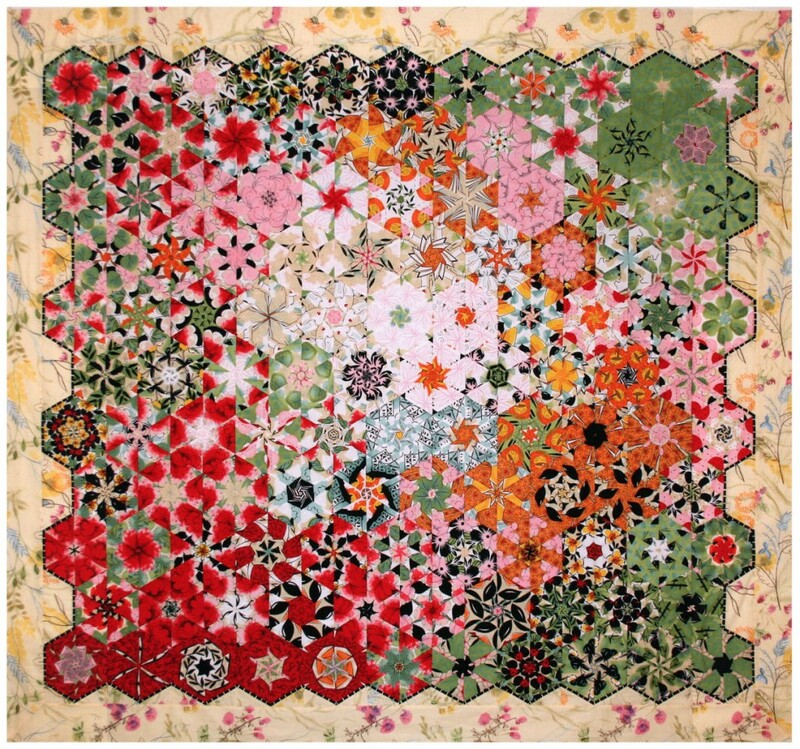 Several friends have made successful quilts using Maxine’s book, and I found a terrific Alexander Henry fabric that may make a dynamic quilt. 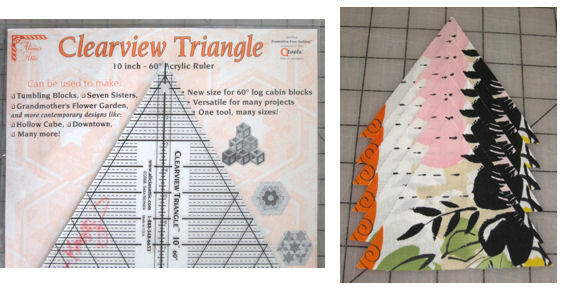 Maxine suggests designs cut with a 60-degree triangle (use any of the great Clearview Triangle rulers) , or a 45-degree triangle (perfect when cut with the Fast2Cut 45-degree half diamond ruler!). I purchased several yards. The book recommends at least 6 repeats plus a few inches for cutting / cleanup. 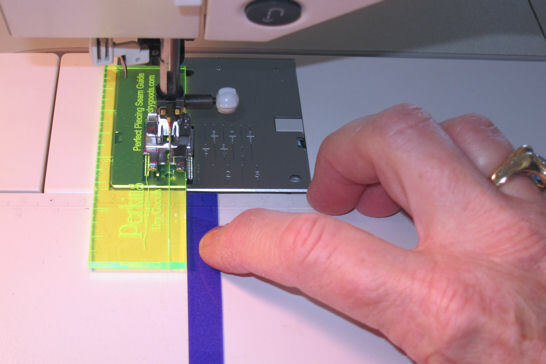 I am cutting 3-3/4″ wide strips, and subcutting through all 6 layers to create sets of identical 60-degree triangles. Watch the blog in the coming days, I’ll show you what I come up with! If you are working with this fabric, please send me YOUR photo, to share with readers!